Restaurant connoisseurs Sheridan Su and Jenny Wong opened Flock & Fowl, 380 W. Sahara Ave., in late 2015. The couple also own Fat Choy, an Asian-American eatery, just blocks east from their newest venture, inside the Eureka Casino. They say, “Less is more,” and nothing is truer than that at Flock & Fowl. Located in Naked City — the area of Las Vegas around the Stratosphere — the restaurant resembles a quaint and chic dining room, providing a contrast to its outside surroundings. The concise menu also allows the staff to serve a handful of perfected dishes rather than numerous “so-so” meals. 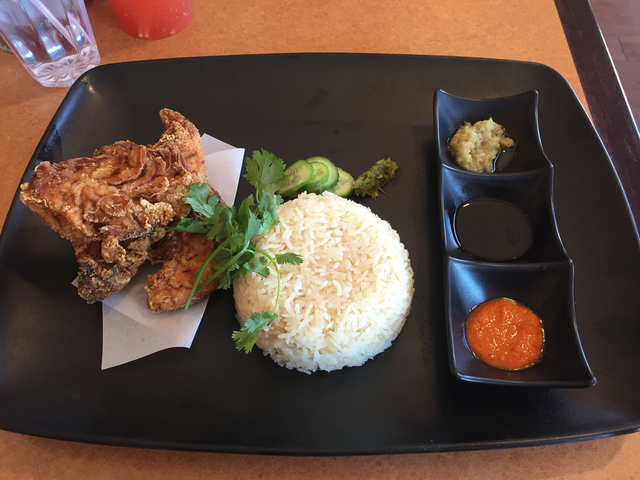 Created from their desire to “serve the perfect plate of chicken rice,” Su and Wong treat each customer like family by only cooking with “natural, pure and fresh” ingredients, including free-range chicken and organic produce. Diners can select from three Hainanese chicken plates, which include their choice of poached chicken, buttermilk fried chicken tenders or roasted spring chicken; chicken rice; marinated cucumbers; preserved mustard greens; and house-made ginger scallion, chile and soy sauces. 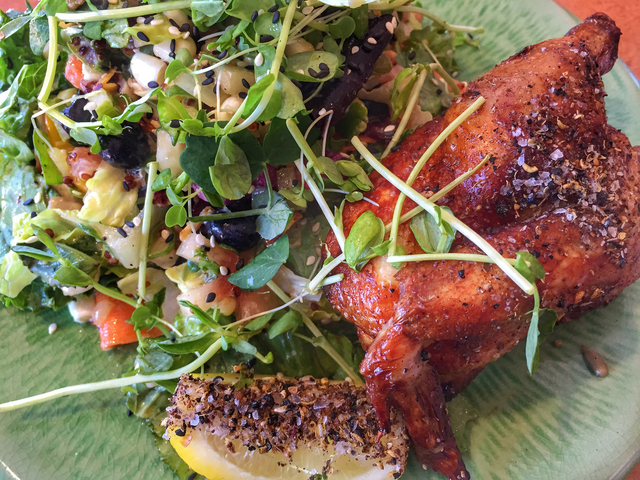 Other dishes include Thai caramel chicken wings with crispy garlic and Flock & Fowl salad (choice of chicken, lettuce, kale, avocado, almonds, sesame vinegar and seasonal fruits and vegetables). Check the locale’s Facebook page at Facebook.com/flockandfowl for daily specials. Most plates cost less than $10. Despite its limited hours and proximity to the bustling Strip, Flock & Fowl is “flocking delicious” and well worth the trip. Flock & Fowl is open from 10:30 a.m. to 3:30 p.m. Tuesdays through Saturdays and closed Sundays and Mondays. Delivery is available through Postmates. Visit flockandfowl.com or Facebook.com/flockandfowl, or call 626-616-6632. Address: 380 W. Sahara Ave. Hours: 10:30 a.m. to 3:30 p.m. Tuesdays through Saturdays, closed Sundays and Mondays. Information: Visit flockandfowl.com or Facebook.com/flockandfowl, or call 626-616-6632.